It was one of the most-awaited events of Pope Francis’ visit to the UAE, and on Tuesday February 5, Pope Francis delivered a Papal Mass to 135,000 people in the UAE. The Mass took place at Zayed Sports City Stadium in Abu Dhabi a little after 10.30am. Pope Francis was first driven around the stadium to a delighted crowd, in what appeared to be a Mercedes G-Wagen Popemobile, before arriving at the altar of the custom-built stage in the middle of the stadium. Pope Francis arrived at the altar to choral music, sung by hundreds of choral singers who are accompanying the mass. Notable figures attending the Mass included UAE Minister for Culture Noura Al Kaabi and Minister for Tolerance Sheikh Nahyan bin Mubarak, who shared a picture to Twitter ahead of the Mass. “Honored to be attending the Holy Mass by @Pontifex at Zayed Stadium in Abu Dhabi with HE Sheikh Nahyan bin Mubarak Minister of Tolerance”, the UAE Minister for Culture tweeted. The Mass also saw readings and Homilies in an array of languages including English, Arabic, Italian, Tagalog, Latin, Korean, Konkani, Malayalam, Urdu and French, according to The National. As the mass ended, applause erupted around the stadium. 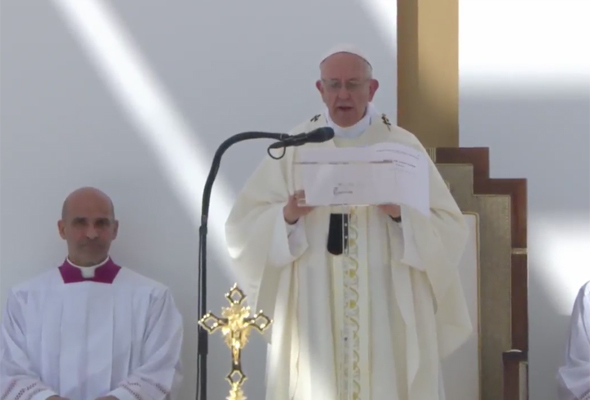 Before his arrival at the public Mass, Pope Francis spent the morning at St Joseph’s Cathedral in Abu Dhabi, where he spoke of his great pleasure to “visit the small churches that are spread all over the place,” he said. The Pope arrived in the UAE on Sunday, and has since attended the Presidential Palace, visited the Sheikh Zayed Grand Mosque and spoke at the Founder’s Memorial at an interfaith meeting.